When I was vegetarian, in my mid-20s through mid-30s, I didn’t set out to vegetarian-ize everything I used to eat prior. Quite frankly it takes a lot of effort to create a respectable, comparable meat-free version of most things, and, quite frankly, most of those original versions are not so hot anyway. I mean that the number of dishes I truly missed from my meat-eating days, whether texture, flavour or both, is relatively small. 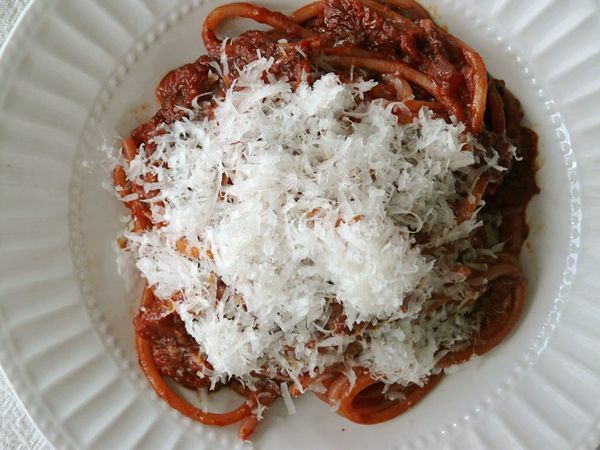 Amatriciana, a classic Italian red tomato sauced-pasta that starts with guanciale (cured pig jowl), is all about the salty, richness that comes from that pork. And it’s damn good. Good enough that I wanted to make a meatless version of this, for sure, yes. I had to replace the saltiness and richness I’d be losing when I omitted the guanciale, and I settled on cured olives and butter, and relied on onions for sweetness. Then I added a lot of paprika to saturate the sauce with colour–Amatriciana is always so red. It worked. This sauce threatens to stain anything it touches. It’s nice to add a flash of chili oil right before serving. 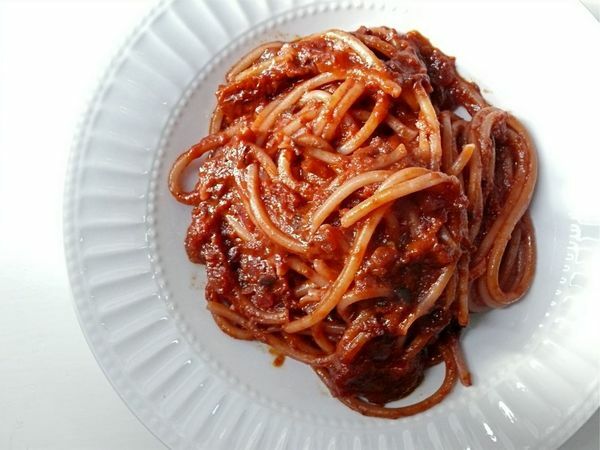 Vivid, salty, spicy, it’s perhaps the boldest meat-free pasta you’ve made, and hopefully, a pretty good spin on Amatriciana. Make it whether your meat-free meals are restricted to Monday or beyond, or if you just can’t find guanciale. Add oil and butter to heated pan. When the butter has melted, add onion and chili, stir to separate the onion pieces and cook over medium-high heat, stirring frequently until softened, about 5 minutes. Add the garlic, both paprika powders, and 1/2 tsp of salt, and cook for a minute until the garlic has softened. Add olives, sun-dried tomatoes, tomato paste and cook for another minute. Add the tomatoes and their liquid and the remaining 1/4 tsp of salt and bring to a simmer for 5 minutes. Remove the pan from the heat and purée the sauce using an immersion blender or a food processor until fairly smooth. Return the pot of sauce to a medium-low heat and simmer for 5 minutes. Taste and adjust seasoning if necessary. Add half-cooked pasta to the sauce and finish cooking the noodles in the sauce. Serve the pasta and top with lots of the grated Parmesan. Serve with chili oil if desired. 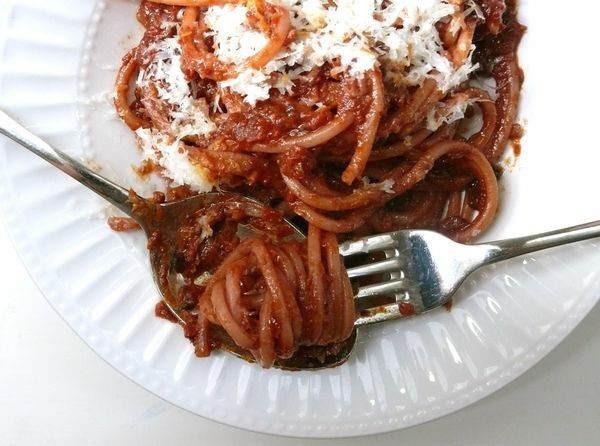 I am drooling over this—if it’s half as good as your bolognese sauce, I am in love with it already! We always have Kalmata olives on hand—do you think they will work or should I spring for some Nicoise olives? aw, thank you ellen! if i only had kalamatas i would make this and im sure it would be good. but if you like this as much as me, youll make it again so hopefully youll try it with nicoise too. Couldn’t find Nicoise olives either jarred or on an olive bar. Guess Atlanta isn’t as sophisticated a city as it fancies itself! 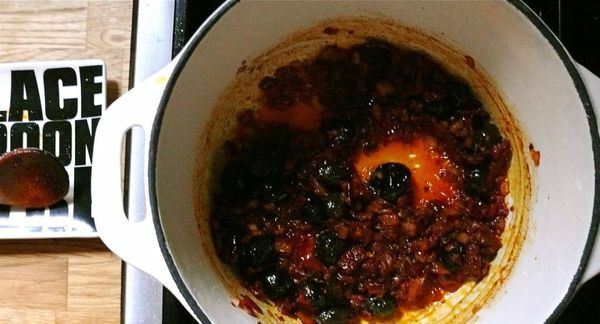 So Kalmata olives it will be….will let you know how it turns out. This looks great. I’ve bookmarked this recipe and the mushroom bolognese. Excited to try it out.